Most Americans who have some knowledge of the early American Navy know that one of the prominent stars was Stephen Decatur Jr. What some do not know, at least I didn’t, is that Decatur met an untimely end when he was sailing a desk, rather than the ships he loved. Today the Father of American Navy is John Paul Jones, who famously won a battle with the British frigate Serapis during the American Revolution. His own ship, the Bonhomme Richard was sinking and the Britisher asked for surrender. Jones famously replied, “I have not yet begun to fight” and somehow turned the tables on the British ship. But at one time Decatur over shadowed Jones for a couple of reasons. For one, the American Navy really did not start (again) until 1794 when Congress authorized the construction of six frigates, mostly for the reason of chastising the Barbary pirates and French privateers under the revolutionary and chaotic government of France. The American Navy at the end of the Revolutionary War had been disbanded (1783) and it wasn’t until the later 1790’s that a professional corp of Naval officers was being established. The other reason Decatur superseded Jones for a time was because of his impressive record and hero status that only gained in time. The Intrepid was filled with explosives and the rest is history. Decatur and his men successfully accomplished their mission and Decatur was noticed by the great Nelson himself, a man who was no slouch when it came to bravery and daring do. At the start of the War of 1812 we find Decatur as a Captain in command of the United States one of three 44-gun super-frigates. While in command of the United States Decatur won the second engagement of the war (United States versus Macedonian) with a British frigate thus proving the first engagement (Constitution versus Guerriere) was no fluke. Decatur spent the better part of the next three years frustrated because the British had pretty well bottled up American ports. In January, 1815 (after the war ended, but news traveled slow in those days) Decatur attempted to run the blockade, this time in command of another super-frigate, the President. The President ran aground in the attempt and badly damaged her keel. Still, Decatur managed to turn the ship to engage the British super-frigate Endymion- a ship especially sent to America to engage the super-frigates. The rest of the blockading British squadron came up and Decatur was forced to surrender the President to a superior force. The surrender did not cause Decatur any loss of prestige. The American people and the Navy understood surrendering if you could not win against heavy odds. What they did not understand was giving up without a fight. Decatur had fought and that was the main thing. This attitude sheds some light on Decatur’s later death. No sooner was the war with Britain over when one of the Barbary States, this time Algeria declared war on the US. Algeria was back to their old tricks of seizing American merchant ships and no doubt had done so at will during the War of 1812 while the tiny American Navy was busy with the British. The difference this time around is that Algeria had a navy of some size, a far cry from the smaller craft the Barbary Pirates could put to sea in 1803. So for this reason an entire squadron of American ships, led by Decatur in the Guerriere was sent to the Mediterranean. Decatur’s Guerriere met the Algerian frigate Mashouda and forced it to strike its colors after it’s captain had been cut in half by a cannon ball. Later Decatur took the Algerian Brig, the Estedio of 22 guns. Despite this reduction in Algerian naval strength the Algerians could still put to sea another seven ships which challenged Decatur when he was headed for Algiers to have a chat with the pirate-in-chief. The Algerians asked Decatur where he was headed, probably hoping to intimidate him into turning back, Decatur answered famously, “American ships sail where they please.” With this the Barbary Wars finally came to an end when Algeria caved. I think this says something about not negotiating with terrorists, but that’s a thought for another story. After the brief war with Algeria Decatur was promoted to the Board of Naval Commissioners. One of their jobs was to assign commands to an expanding American Navy. Decatur in his capacity as a commissioner refused to appoint James Barron to the command of a new ship of the line being built (Columbus, 74 guns). Decatur’s reason for the refusal was because Barron had commanded the frigate Chesapeake in 1807. 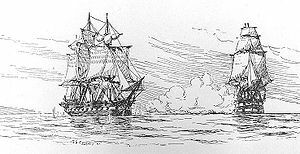 HMS Leopard approached Chesapeake in 1807 with the intent to board and impress Americans and to reclaim British deserters who served willingly on American ships. 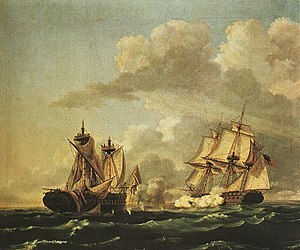 Barron would not allow it and Leopard fired seven broadsides into Chesapeake without the Chesapeake responding in kind. Barron surrendered the ship without firing shot. The incident was a rather big deal and created an international to-do and it nearly led to the War of 1807 rather the War of 1812 when James Madison finally had enough of the impressment issue and declared war on Britain. So fast forward to 1820. 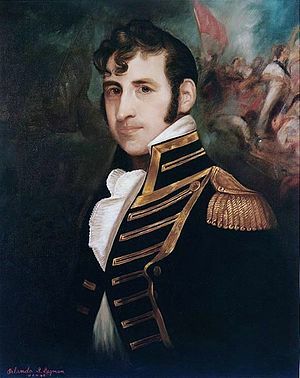 The naval commissioner Stephen Decatur Jr. blocks the appointment of James Barron to the Columbus on the basis of not firing a shot in the Leopard-Chesapeake incident of 1807. In an era when the slightest offense could lead to a duel this was much larger potatoes for it was an implication of cowardice that Barron did not return fire. Honor would have demanded that he at least would have fired one gun, even he was outclassed (he was) to show some fight. But he didn’t and Decatur called him on it in 1820. Eventually Decatur agreed and the two met in March of 1820 outside of Bladensburg, Maryland. Both men were badly wounded, but Decatur’s was fatal and he died a few hours after the duel. Thus ended the career of one of America’s earliest naval heroes. This summary was gleaned primarily from John Lehman’s On Seas of Glory-Heroic Men, Ships, and Epic Battles of the American Navy. A great article Bruce…I have little knowledge of the early American Navy so this was very interesting…I Must say that your quote about the number of Americans aboard HMS Victory is a little out…at the muster before the battle the Victory had a total of 820 men aboard of whom about 71 were foreigners and of that about 22 were American. Thanks Nick for the comment. I was hoping someone would comment on that because I thought it a bit high myself. I think I got the tidbit from Lehman but it might have been the author of Six Frigates or both. I’ll have to check. Your numbers seem more realistic but I know there was much fuzzy counting especially by the Royal Navy. For example, anyone born prior to 1776 in America was counted as a British subject. The Royal Navy routinely ignored American papers of citizenship. To be sure the RN reclaimed a lot of deserters but they also claimed “British” on some pretty shakey grounds. To make matters worse the differences between British and American English were not as pronounced as they are now so who could say who was who. On the other side of the coin it behooved the Americans to over state British high handedness and I suspect the Victory story is a good example of us padding the numbers and now it’s a bit of a myth. Thanks for the comments. I do appreciate them and I appreciate the correction.